I checked on the assembly of my 404 stroker Cleveland last week, and there is an assembly issue that neither me, my builder or others I have spoken with can explain. The block is an iron four bolt version bored 10-over. 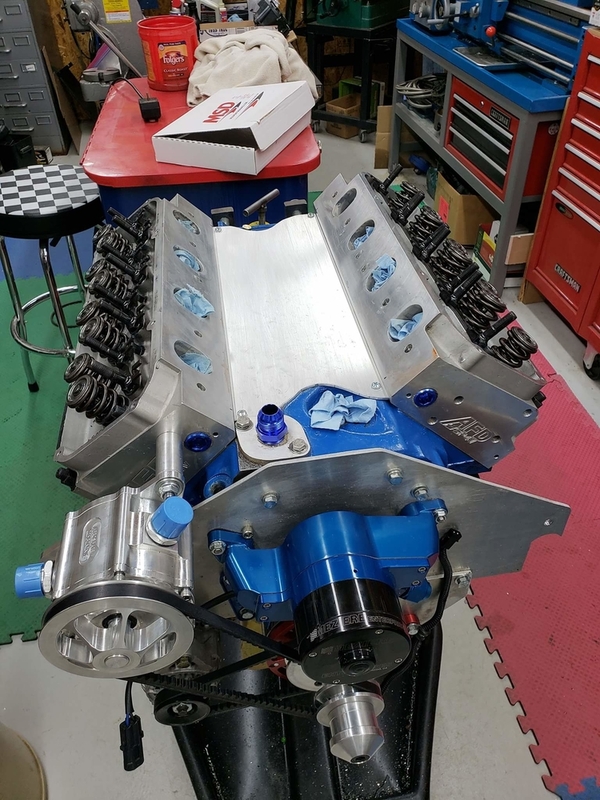 The heads are new, out of the box CHI 4V aluminum and the intake is a new, out of the box blue thunder Pantera version. Both the front and rear China-wall gaps, between the block and the intake, are approximately 1/4 inch wide, perhaps even a little bit more. All the intake manifold bolts dropped into their respective threaded holes slick as butter. Assembly of the manifold used the cork gaskets and additional RTV to completely close the gap. No one seems to have an explanation as to why this gap is so large. Has anyone ever come across something similar, or have any input that might explain this? I tend to just lay thick beads of rtv on those gaps with no gaskets. Due to the variations using decked blocks, resurfaced heads, milled intakes. 1/4" doesn't seem that bad. The key is the bolts are threading with ease which it sounds like you are good on. The problem I recently ran into was the intake gaskets had to be elongated slightly on the 4 middle holes. The tops of these gaskets were bumping up against the valve cover gaskets. I have a sheetmetal intake that has a larger gap than my cast intakes, so I'm guessing the intake valley depth on the casting will play a part the degree of gap. See video below, I just don't have pictures of the gap variances. CHI heads have raised intake ports, the heads are manufactured a bit wider than factory heads. 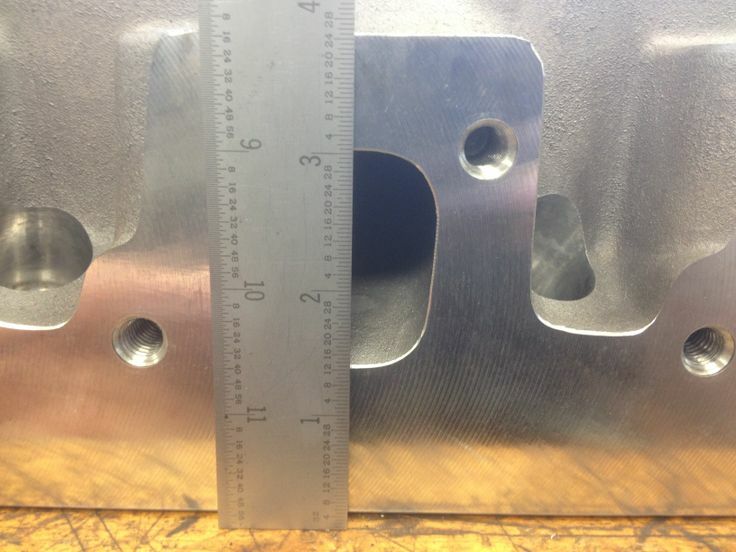 The extra width of the heads causes the 4V intake manifolds to sit higher when dropped into the gap between the heads. This aligns the intake manifold runners with the cylinder heads' raised intake ports. I have been doing some additional research on the valley end wall gaps that have been found on my engine build using the CHI 4V heads. Today I received the following email direct from CHI in Australia, which fails to support the previous explanation from George. 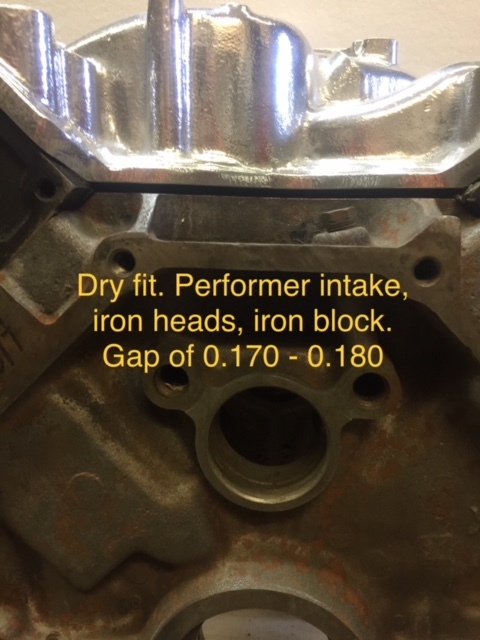 But this explanation and suggested solution of machining the intake fails to address the fact that all of the intake bolts were perfectly aligned with the cylinder heads. Thought this information should be made available to others. I can't recall exactly, but wouldn't you be able to make a measurement with a big pair of calipers between the machined sides of the heads? You could compare it to one of the sets of 4V heads I am sure you have laying around in your garage. The fact that the manifold bolt holes line-up should be a dead give away. Lay one of the heads on a table, combustion chamber facing downward. 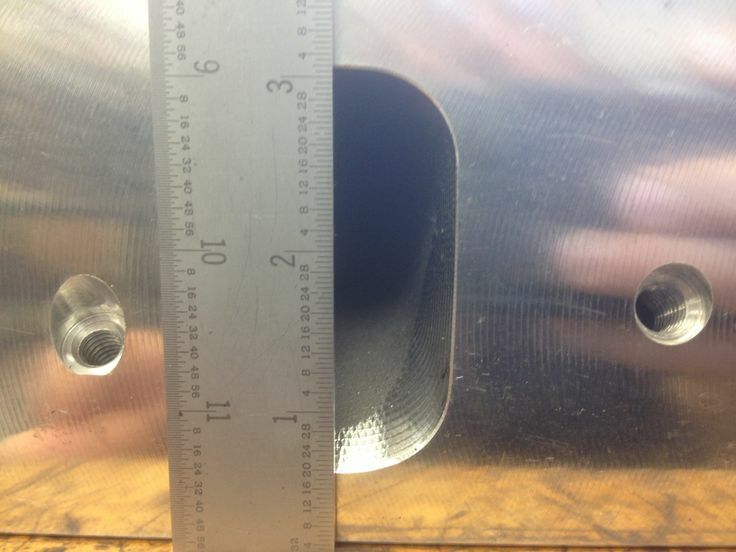 Measure from the table top to the top of the intake port. If it is any amount significantly more than 3 inches, the port is raised. If its 3 inches then I am wrong. We have pulled the intake and heads off of the engine due to a dyslexic and asleep at the wheel problem regarding the head gaskets. Turns out the Fel-Pro gasket number for a Windsor is 1031 and the number for a Cleveland is 1013. I’m afraid you all can guess what happened, just glad that I caught the problem when going over the build sheet. I am returning to my engine builder tomorrow but fear he has already installed the heads this afternoon. I did tell him to delay installing the manifold pending further investigation on this issue. Whether the ports are raised or the manifold was somehow incorrectly machined are both certainly questions worth answering. However, since everything bolts together just fine I am inclined to just find an acceptable manner to fill the large gap rather than try to diagnose exactly what is happening. I have learned another owner had his engine builder fabricate spacers when faced with this problem. Is anyone aware of a source for pre-made end valley spacers? Why is it called a “china wall”? I hadn’t heard of that before. I will be following a suggestion from the email list and will take my old performer manifold to the shop tomorrow for a trial fit. This should at least give us some idea whether the heads or the intake are the problem child. I did not use the China wall term in my email to Australia. However, I have heard that term previously but do not know from where. My engine builder had also never heard the term. Esoteric term originating in California's central valley. CHI used to sell them, honest, no lie. So its valley spacers now, not china wall spacers? I did a dry fit of the performer on iron heads and iron block. I did a dry fit of the blue thunder on the very same iron heads and iron block. Tomorrow I will take a iron head to the shop and compare it to the CHI head. Looks like the CHI representative who replied to my email doesn’t really know what their engineers have done with their design. The extra width of the CHI head will be immediately obvious. 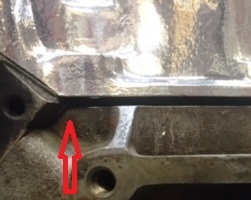 Notice in the picture how the manifold face of the factory cylinder head is right at the corner formed by the valley rail and the cylinder head deck. The manifold face of the CHI heads will stick-out beyond that corner. The spacers CHI once sold had wedge shaped ends that would allow the spacers to fit under the heads, necessary because of the way in which the heads stick-out over the valley rails. would you see that extra width if you bolted a CHI to an iron head.? 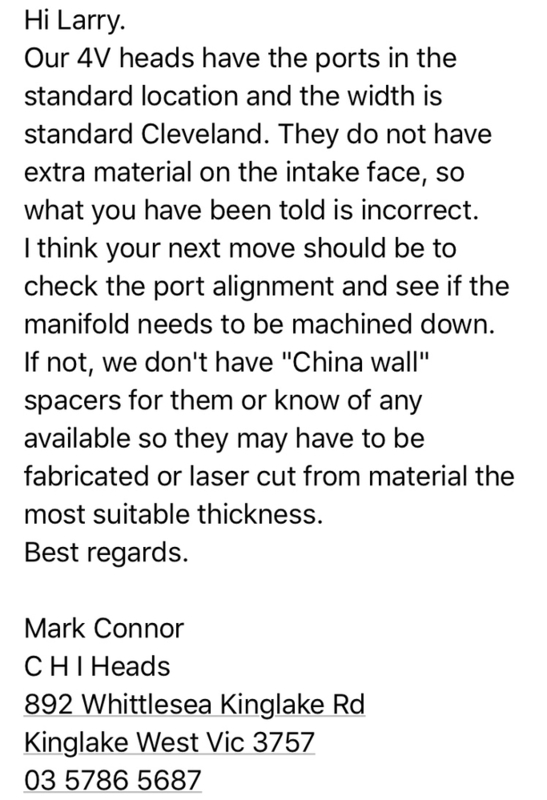 if the china wall gap was 0.25", I would expect that extra width (on the intake side) to be about 0.12"
Thank you, George, for that additional bit of information. That is now added to my list of things to check when I return to my engine builder tomorrow. And that one seems to be a pretty easy visual check. I have sent an email back to the CHI representative, outlining with photos and text what I have discovered and requesting that he actually contact their engineers for their feedback. I also specifically asked for him to check on the spacers you said they once offered. Do you think it is possible that there were slight differences between the USA heads and the Australian heads? This might explain why they do not believe there are any changes in their design, if Australian heads were used as their base point? Edelbrock sells end rail spacer (Part #7726) for Windsor SBF for their Victor heads, so maybe it is more common than we think. Don't know if it helps. chi heads/chi intake, sides used an incorrect homemade gasket instead of the .060 chi gasket that was destroyed by the builder when they had to take it apart again. Normally I think only the bottom is siliconed. Larry, I cam across a similar issue a number of years ago. The CHI 3V heads and intakes are dimensionally different than Ford 335 series heads. 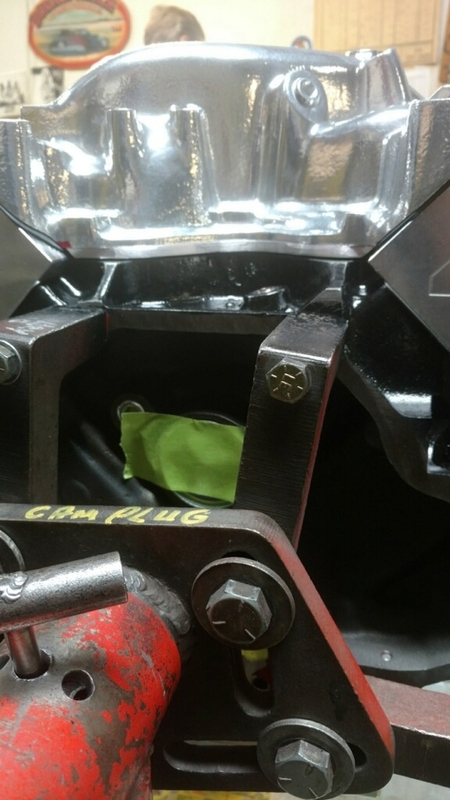 Besides the port location, the head is 1/4" wider in the direction the moves the face of the intake ports inward. This means CHI 3V Heads wont interchange with Ford dimensioned intakes and CHI 3V intakes wont mount to Ford spec 335 series heads without slotting the intake bolt holes. I used this to advantage on fitting a dual plane 3V 9.5 intake to match C302B high port heads as the mismatch cause the ports and bolt holes to line up near perfectly on that combination but I actually had to mill a little off the intake land that seals the valley rail for it to land properly. When I inquired of CHI about the mismatch and suggested it may be appropriate to state such variances on their website they were nothing short of indignant with me as to why anyone would use anything but CHI lids with CHI heads.....which didn't sit too well with me but Ce La Vie. More recently I've noticed many of there intakes have slotted mounting holes but I don't know if enough to accommodate the 3V mismatch. During that same CHI exchange, I asked if that was the case with the rest of their product line, namely the so-called "4V heads". They said 4Vs had standard 335 series port position and mounting pattern on both intake and exhaust. Just because they say that may not mean the head dimension you are observing isn't different and they have compensated on the other machining of the mounting locations. Just wondering if you've verified the exhaust side and port position are what you expected. 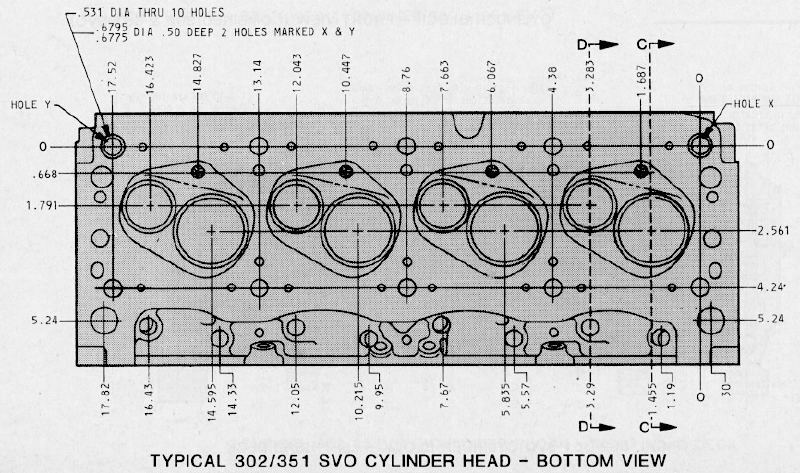 I did a write up on the subject over at the 351 forum; search "CHI 3V Heads and Intake" there. I'd say just make an aluminum spacer and screw/glue it to your block instead of the intake so the issue doesn't repeat in the event of future intake swaps. Many people think CHI did that to confound the copiers. Sort of amusing when you consider they're copying a Ford 335 series platform themselves. Doesn't make sense to me cuz it's just as easy to copy that too. It seems more likely to me they did it to enable/gain another .25-.30" port roof height. Despite my experience I think they make a good product and save a few quality problems which all manufacturers suffer from time to time, in my view the only advantage if any they offer over my 30+ year old high port Ford heads is combustion chamber design but I still say the rest is more about who is working the parts than the parts themselves. Did some side-by-side comparisons today with the CHI aluminum heads and my old Ford iron heads. 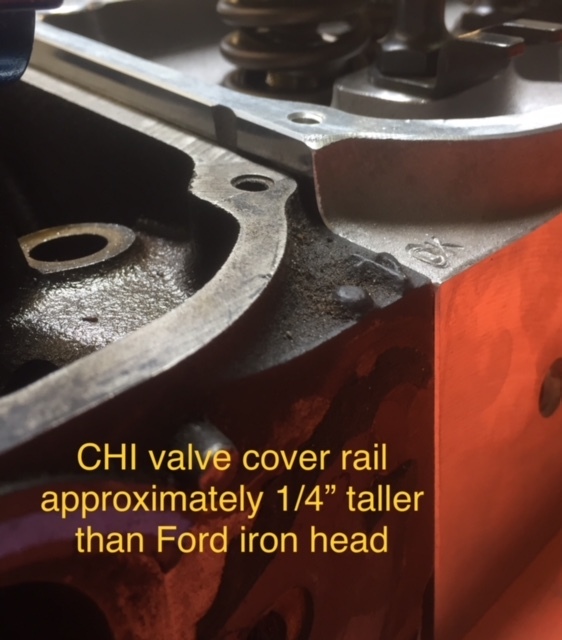 Because the CHI heads are brand new, and the iron heads have likely been milled some time in their history, definitive comparisons are subject to some qualifications when comparing the height of the threaded holes for the headers and intake, but it appears both have been raised to some degree, the headers most likely definitively raised even accounting for some iron head milling. I still need to take photos of the performer manifold when the new CHI heads are bolted in place to see if it also displays a 0.270” gap as seen with the Blue Thunder manifold. Stand by for that. But when it comes to the valve cover rails, there is no question that CHI has raised them by roughly 1/4”. Did you measure the port height? have a pic or 2 of CHI 4V port height! 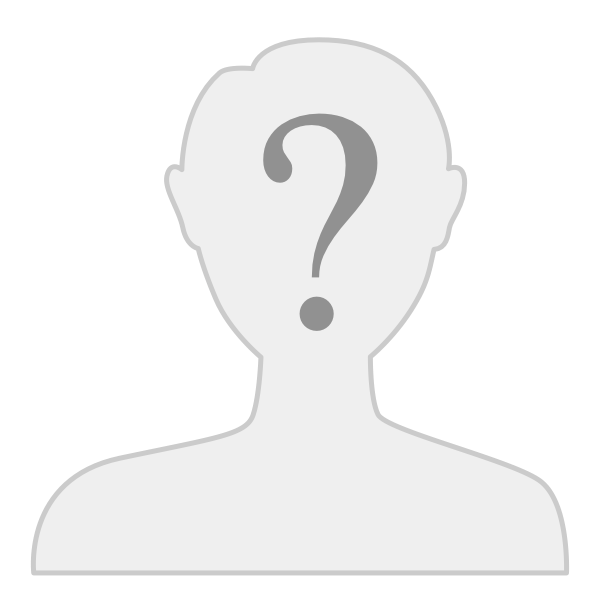 My solution with AFD heads. .125 aluminum. what seals the sides, just RTV along the edge? screws use the existing holes in the china wall? is your cover trapped below the heads and mitered at the edge? 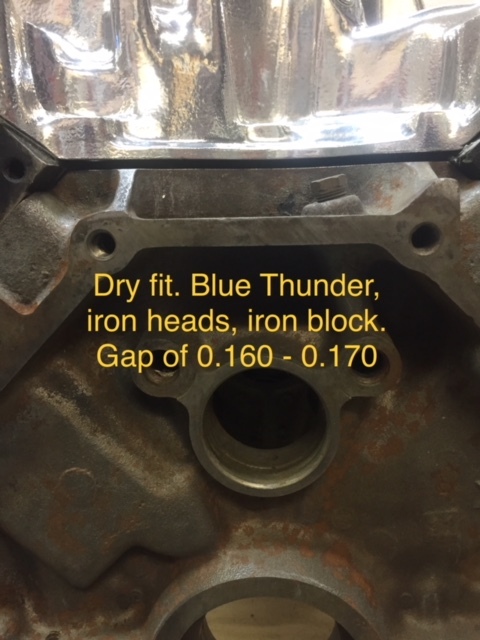 Because the aluminum heads are brand new and the iron heads may have been milled more than once or twice in the last 45 years, I am not sure we can ever come to a definite determination as to why the gap is so large. My engine builder has fabricated aluminum spacers, the dry fit gap is .060 and RTV silicone will take care of that quite easily. the intake faces of the heads remain at the same angle, in the same plane and at the same distance apart from each other. am i seeing things or is the intake face of the alloy head 'proud' of the break point of the china wall and the deck surface, intruding into the intake manifolds' space? I understand your concern about the head intrusion issue but the photo is not quite clear on this, and I have not viewed the engine in person. I intend to visit my builder tomorrow and that will be one of the issues I will check. George previously mentioned this, thank you for your reminder.